Neat gadgets that solve small problems are easy to find. But less common are devices that both please a broad audience and aspire to do a bit of good for a smaller niche. The problem, according to SanDisk founder Eli Harari, is that companies don’t want to pour time and money into projects that will only benefit a small audience. Harari is an angel investor in Woojer, a portable body-shaking subwoofer now raising funds on Kickstarter. The device could be a boon for the hearing-impaired community, Harari said, because feeling the rumble of low bass tones doesn’t require good hearing. 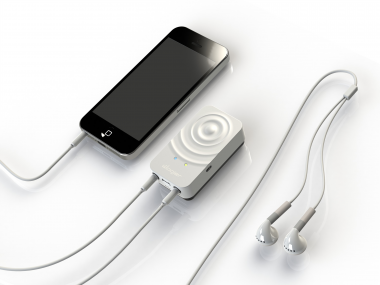 But the company’s best chance for Kickstarter success and beyond will be targeting Woojer at gamers and other mobile media consumers with unimpaired hearing. “The problem, marketing-wise, is they don’t want to position it as something for the hearing impaired because gamers and music lovers will say, ‘I don’t want this device, I’m not hearing impaired,'” Harari said. The impaired community, he added, is a “tiny market,” but “shouldn’t be penalized for being a small group.” At CES in 2006, when Harari was still CEO of SanDisk, he was approached by a deaf woman who said through a sign language interpreter that she consistently felt neglected by tech companies. “I said, ‘I’m sorry, but I don’t know what we could do,'” he recalled. Last year, he pledged to invest in Woojer if and only if the company made addressing hearing loss one of its then-in-development product’s main focuses. Right in line with Harari’s marketing/positioning remark, Woojer’s Kickstarter project page leads with the broader consumer angle, with a quote from “Zero Dark Thirty” executive producer Ted Schipper. So far, the project has raised nearly half of its $100,000 goal in order to finance a first manufacturing run, and according to Kicktraq it’s currently trending toward success. Harari said he’s one of a handful of pre-Kickstarter investors in the project, and that increasingly, success on the crowdfunding site is being seen as an indicator of whether something has a big enough addressable audience. This is not a review, but I briefly demoed Woojer last week at GDC Next in Los Angeles and found that it worked as advertised for non-impaired gamers with two of my bass-heavy games, Super Hexagon and Boson X, as well as music supplied by the Woojer team. Co-founder Neal Naimer suggested that once users get used to having a subwoofer clipped to their bodies, they might turn down their games’ volume — which could stave off hearing loss in the first place.